For the holiday-shortened week, the Dow declined 1.9% (up 5.2% y-t-d) and the S&P500 fell 1.4% (up 2.5%). Today's dismal employment report supported the faltering economy view - and cyclical stocks suffered. The Transports were hit 3.1% this week (up 3.8%) and the Morgan Stanley Cyclical index 2.3% (up 12.4%). Defensive stocks performed somewhat better. The Utilities slipped 0.3%, and the Morgan Stanley Consumer index declined 1.4% (up 1.3%). The broader market was under selling pressure, with the small cap Russell 2000 down 2.2% (down 1.5%) and the S&P400 Mid-cap index 1.1% (up 6.1%). The NASDAQ100 declined 1.6% (up 11.5%), and the Morgan Stanley High Tech index slipped 0.5% (up 11.4%). The Semiconductors lost 0.9% (up 5.3%). The Street.com Internet Index declined only 0.3% (up 11.5%), while the NASDAQ Telecommunications index dropped 2.4% (up 14.5%). The Biotechs gained 1.8%, increasing y-t-d gains to 4.8%. Financial stocks were, again, under pressure. The Broker/Dealers fell 2.6% (down 10.4%), and the Banks declined 2.7% (down 12.1%). With bullion surging $27.20 to break above $700, the HUI index rallied 8.6% (up 5.9%). 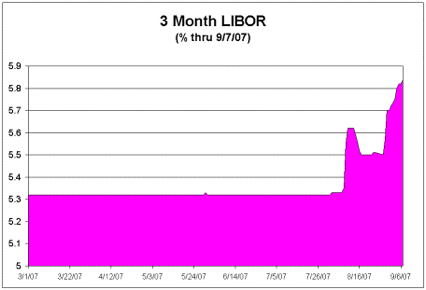 Three-month T-bill rates declined 5 bps this week to 4.06%. Two-year U.S. government yields sank 25 bps to 3.90%, and five-year yields fell 22 bps to 4.04%. Ten-year Treasury yields dropped 17 bps to 4.38%. Long-bond yields ended the week down 14 bps to 4.70%. The 2yr/10yr spread ended the week at 48 bps. The implied yield on 3-month December ’07 Eurodollars sank 19.5 bps to 4.74%. Benchmark Fannie Mae MBS yields fell 22 bps to 5.78%, this week outperforming Treasuries. The spread on Fannie’s 5% 2017 note narrowed about 4 to 50, and the spread on Freddie’s 5% 2017 note narrowed 4 to 50. The 10-year dollar swap spread declined 4 to 65.75. Corporate bond spreads generally narrowed somewhat, with the spread on a junk index ending the week 18 bps narrower. Investment grade debt issuers included Astrazeneca $6.9bn, Barclays $2.05bn, Bank of America $1.7bn, Lowes $1.3bn, Rohm & Haas $1.1bn, HSBC $750 million, Husky Energy $750 million, Cargill $750 million, Virginia E&P $600 million, CSX $1.0bn, EOG Resources $600 million, Commonwealth Edison $400 million, Starwood Hotels $400 million, Texas Eastern $400 million, Duke Realty Kentucky Power $325 million, $300 million, and National Realty Properties $250 million. German 10-year bund yields sank 12 bps to 4.12%, while the DAX equities index dropped 2.6% (up 12.7% y-t-d). Japanese 10-year “JGB” yields declined 1.5 bps to 1.585%. The Nikkei 225 dropped 2.7% (down 6.4% y-t-d). Emerging debt and equity markets were mixed to higher. Brazil’s benchmark dollar bond yields were little changed this week at 6.06%. Brazil’s Bovespa equities index jumped 3.2% (up 22.7% y-t-d). The Mexican Bolsa declined 0.5% (up 14.1% y-t-d). Mexico’s 10-year $ yields dropped 10 bps to 5.50%. Russia’s RTS equities index slipped 1.1% (down 1.2% y-t-d). India’s Sensex equities index gained 1.8% (up 13.1% y-t-d). China’s Shanghai Composite index added 1.1% to close at yet another record high (up 97% y-t-d and 218% over the past year). Freddie Mac posted 30-year fixed mortgage rates added one basis point this past week to 6.46% (down 1bp y-o-y). Fifteen-year fixed rates rose 3 bps to 6.15% (down 1bp y-o-y). One-year adjustable rates fell 10 bps to 5.74% (up 11bps y-o-y), reversing less than half of last week's sharp increase. Bank Credit expanded $18.8bn (week of 8/29) to a record $8.810 TN (5-wk gain of $169bn). Bank Credit has expanded $513bn y-t-d, or 9.2% annualized. For the week, Securities Credit was about unchanged. Loans & Leases jumped $18.7bn to $6.454 TN (5-wk gain of $125bn). C&I loans increased $6.2bn, and Real Estate loans rose $8.3bn. Consumer loans gained $4.6bn. Securities loans slipped $0.7bn, while Other loans added $0.3bn. On the liability side, (previous M3) Large Time Deposits increased $1.4bn. M2 (narrow) “money” surged $64.9bn (2-wk gain $111bn) to a record $7.400 TN (week of 8/27). Narrow “money” has expanded $356bn y-t-d, or 7.5% annualized, and $522bn, or 7.6%, over the past year. For the week, Currency added $0.2bn, and Demand & Checkable Deposits rose $15bn. Savings Deposits jumped $18bn, and Small Denominated Deposits increased $2.3bn. Retail Money Fund assets surged $29.4bn. Total Money Market Fund Assets (from Invest. Co Inst) jumped $38bn last week to a record $2.802 TN (5-wk gain of $195bn). Money Fund Assets have increased $420bn y-t-d, a 25.5% rate, and $576bn over 52 weeks, or 25.9%. Total Commercial Paper contracted another $54.1bn last week to $1.925 TN. After a four-week decline of $298bn, total CP outstanding is now down $49bn y-t-d. Asset-backed commercial paper fell $26bn to $959bn, with a four-week decline of $214.4bn (after beginning the year at $1.084TN). Total CP has now increased only $66bn, or 3.5%, over the past 52 weeks. Asset-backed Securities (ABS) issuance was a puny $500 million this week. Year-to-date total US ABS issuance of $443bn (tallied by JPMorgan) is now running about 24% behind comparable 2006. At $209bn, y-t-d Home Equity ABS sales are about a half of last year’s pace. Year-to-date US CDO issuance of $242 billion is now running only 5% ahead 2006 sales. Fed Foreign Holdings of Treasury, Agency Debt last week (ended 9/5) increased $0.8bn to $1.980 TN. “Custody holdings” were up $228bn y-t-d (18.8% annualized) and $300bn during the past year, or 17.8%. Federal Reserve Credit last week expanded $6.6bn to $857bn. Fed Credit has increased $4.4bn y-t-d and $24.5bn over the past year (2.9%). September 7 – Market News International: “Japan’s foreign reserves hit a record $932.16 billion at the end of August, rising for the third consecutive month and surpassing the previous record high of $923.72 billion marked at end-July… The country’s forex reserves remain the second largest in the world, next to China’s, which is estimated at $1.33 trillion…"
International reserve assets (excluding gold) - as accumulated by Bloomberg’s Alex Tanzi – were up $920bn y-t-d (27.6% annualized) and $1.143 TN y-o-y (24.9%) to $5.731 TN. September 7 – Bloomberg (John Glover): “Money markets have seized up because lenders don’t trust the quality of assets they hold and reckon their peers are in the same boat, said Bob Janjuah, a credit strategist at Royal Bank of Scotland… Central banks around the world have pumped more than $350 billion into financial markets to ease cash shortages prompted by banks refusing to fund each other for longer than overnight. Lenders are concerned they will need to bail out their own businesses that bought bonds backed by assets including U.S. subprime mortgages. ‘Banks know they're probably going to have to take a heap of assets on to their balance sheets,’ said…Janjuah… ‘There is concern as to the quality of the assets that will be coming onto the balance sheet, so this creates fear in the interbank market.'" September 7 – Bloomberg (Jody Shenn): “Collateralized-debt obligations backed mostly by subprime-mortgage bonds and with A ratings were offered for sale last month at prices between 25 cents and 50 cents on the dollar, according to Deutsche Bank AG. The prices reflect more CDO ratings downgrades amid increasing U.S. homeowner defaults, as well as ‘heightened risk version,’ analysts led by Anthony Thompson in New York wrote… BBB and BB rated bonds were quoted from 15 cents to 40 cents on the dollar, they said." September 5 – Bloomberg (Sean B. Pasternak): “Owners of asset-backed commercial paper issued in Canada could lose half their money because the funds are backed by credit default swaps that have lost value, a fund manager told the National Post. Most of the C$35 billion ($33.2 billion) in Canadian commercial paper not owned by banks is backed by bets on credit default swaps, the newspaper said." September 5 – Bloomberg (Darrell Hassler): “Global sales of new collateralized debt obligations fell to the lowest in more than year as investors fled securities that hold subprime mortgages, Morgan Stanley said. There were $17 billion in CDO sales from 35 transactions in August, down 54% from July..."
September 4 – Bloomberg (Elizabeth Stanton and Daniel Kruger): “The global flight to the safety of government debt is causing the widest price swings in Treasuries in three years, driving away traders who rely on computer models to guide their strategies and raising costs for investors. Volatility rose last month to the highest since May 2004 as investors, jolted by losses in securities contaminated by defaulted subprime mortgages, bought U.S. debt, according to data compiled by Merrill Lynch & Co. Morgan Stanley…halted computer-driven buying and selling of Treasuries, said Sanjay Verma, head of U.S. government bond trading. The retreat by so-called black-box traders and hedge funds caused orders for Treasuries to drop as much as 80%..."
September 5 – The Wall Street Journal (David Reilly, Carrick Mollenkamp and Robin Sidel): “Though few investors realize it, banks such as Citigroup Inc. could find themselves burdened by affiliated investment vehicles that issue tens of billions of dollars in short-term debt known as commercial paper. The investment vehicles, known as ‘conduits’ and SIVs, are designed to operate separately from the banks and off their balance sheets. Citigroup, for example, owns about 25% of the market for SIVs, representing nearly $100 billion of assets under management. The largest Citigroup SIV is Centauri Corp., which had $21 billion in outstanding debt as of February 2007, according to a Citigroup research report. There is no mention of Centauri in its 2006 annual filing with the Securities and Exchange Commission." September 6 – Bloomberg (Steve Rothwell): “The global credit rout sparked by the U.S. subprime mortgage slump may leave as much as $34 billion of leveraged loans for railroads, tollways and similar projects ‘paralyzed,’ said analysts at Standard & Poor’s. Banks are less likely to lend to infrastructure projects after being saddled with as much as $332 billion of unsold leveraged loans, the S&P report said." September 5 – Bloomberg (Ben Sills): “The surge in short-term rates caused by rising defaults of U.S. subprime mortgages exposed ‘serious imperfections’ in the way global credit and housing markets function, said Jean-Philipe Cotis, chief economist at the Organization for Economic Cooperation and Development. ‘Recent developments have revealed serious imperfections in the functioning of U.S. housing markets and, more broadly, in credit markets worldwide,’ Cotis said." The dollar index declined 1.0% to 79.96, a 15-year low. On the upside, the Japanese yen increased 2.3%, the Swiss franc 1.7%, the Norwegian krone 1.5%, the Swedish krona 1.5%, the Danish krone 1.1%, and the Euro 1.1%. On the downside, the New Zealand dollar declined 1.9%, the Mexican peso 1.1%, the South African rand 0.9%, and the South Korean won 0.3%. For the week, Gold jumped 4.0% to $700.6, and Silver gained 4.3% to $12.76. Copper, on the other hand, was hit for 4.3%. October crude rose $2.66 to $76.70. October gasoline gained 1.1% and October Natural Gas 0.6%. For the week, the CRB index increased 1.1% (up 1.6% y-t-d), and the Goldman Sachs Commodities Index (GSCI) jumped 2.2% (up 16.7% y-t-d). September 6 – The Wall Street Journal (Sebastian Moffett and Yuka Hayashi): “Taking over as Japan's finance minister after his party suffered a bad election defeat, Fukushiro Nukaga needs to grapple with his country’s big financial dilemma. Japan, since the turn of the century, has amassed the largest outstanding debt by far among the world's rich nations.... This year, outstanding debt is equivalent to 179% of gross domestic product, according to calculations by the Organization for Economic Cooperation and Development. The U.S. figure is around 63%." September 6 – Bloomberg (Nipa Piboontanasawat): “China ordered banks to put aside more money as reserves for a seventh time this year to cool the world’s fastest-growing major economy after inflation surged to a 10-year high. Lenders must set aside 12.5% of deposits…up from 12%..."
September 7 – Bloomberg (Greg Quinn): “Canada’s unemployment rate stayed at a 33-year low in August and wages rose the most in six years, suggesting there’s a risk of faster inflation even as central bankers pause amid turmoil in financial markets. The economy created 23,300 jobs, beating forecasts and keeping the jobless rate at 6%..."
September 6 – Bloomberg (Simone Meier): “German manufacturing orders dropped the most in at least 16 years in July after a decline in sales of ships, trains and airplanes. Orders, adjusted for seasonal swings and inflation, fell 7.1% from June, when they gained 5.1%..."
September 6 – Bloomberg (Robin Wigglesworth): “Norway’s statistics agency raised its forecast for economic growth this year after unemployment fell to the lowest in 19 years and consumer demand soared. The mainland economy, which excludes oil and shipping, will expand 5.1%, compared with the previous estimate of 4.1%..."
September 7 – Bloomberg (Elizabeth Hester): “Countrywide Financial Corp., the nation’s biggest mortgage company, may reduce its workforce by 10,000 to 12,000 in the next three months, a 20 percent cut. The lender expects loan originations to drop 25% in 2008 from this year’s levels, the …company said… The cuts are the biggest in the mortgage industry during the worst housing slump in 16 years. More than 15,000 jobs have been eliminated this week alone..."
September 7 – Bloomberg (Elizabeth Hester): “IndyMac Bancorp Inc., the second-biggest U.S. mortgage company, plans to cut 10 percent of its workforce and lower the dividend as housing sales falter and home-loan defaults climb. It may post a loss for the first time in at least eight years." September 7 – Bloomberg (Bob Willis): “The U.S. economy unexpectedly lost jobs in August for the first time in four years, increasing speculation that the Federal Reserve will have to reduce interest rates to counter an economic slowdown. Employers cut 4,000 workers from payrolls, compared with a revised gain of 68,000 in July that was smaller than previously reported, the Labor Department said today in Washington. The unemployment rate held at 4.6 percent as almost 600,000 people left the workforce. Bonds rallied and the dollar weakened. ‘The recession risk has certainly increased,’ said Zach Pandl, an economist at Lehman Brothers… The drop in jobs is the clearest sign yet that the deepening housing recession and turmoil in credit markets are hurting the wider economy... LandAmerica Financial Group Inc., a...Virginia-based title insurer, said...it will eliminate 1,100 jobs...as mortgage originations decline. Lehman Brothers Holdings Inc. and Accredited Home Lenders Holding Co., and HSBC Holdings…said last month they would cut a total of 3,400 jobs..."
September 6 – Bloomberg (Ellen Pinchuk and Cherian Thomas): “Stephen Roach, chairman of Morgan Stanley in Asia, comments on the subprime crisis and the role of central banks: ‘World central banks in the last seven years have allowed the world to lurch from equity bubbles, property bubbles, credit bubbles to subprime bubbles. They claim they can accomplish everything by their fixation on the narrow consumer price inflation target. Guess what, that target doesn't work in today’s increasingly interdependent, complex world financial markets. We really need an overhaul in the way central banks go about conducting monetary policy before it’s too late… Look at Japan. Eighteen years later after the equity bubble burst, its economy is going nowhere. And that’s the lesson of letting an asset dependent economy get out of control.''" September 6 – Associated Press: “A third of home loans originated by mortgage brokers failed to close in August as investors shied away from riskier borrowers, a new survey says. The survey of 1,700 mortgage brokers sponsored by trade publication Inside Mortgage Finance comes as numerous lenders that catered to subprime borrowers with weak credit close down and lenders back away from riskier lending practices common in recent years. That has led to many borrowers being stuck without a loan as they prepare to settle. ‘There’s a problem with funding commitments not being honored’by lenders, said Thomas Popik, who designed the survey for…Campbell Communications. Three years ago, Popik said, a survey of real estate agents found that only 4% of transactions failed to close on average. The survey also found that some homebuyers backed away from deals last month… The survey also found that nearly half of borrowers with adjustable rate mortgages were not able to refinance their loans. That’s a major concern of policymakers as an estimated that 2.5 million mortgages given to borrowers with weak credit will reset at higher rates by the end of next year, according to the FDIC." September 6 – Bloomberg (Shannon D. Harrington): “Trading in an index that reflects speculation on the leveraged loan market soared to $350 billion since debuting May 22 as investors rushed to hedge the risk that debt prices would plunge under the weight of leveraged buyouts." September 5 – Bloomberg (Hui-yong Yu and David M. Levitt): “U.S. commercial real estate prices may fall as much as 15% over the next year in the broadest decline since the 2001 recession as rising borrowing costs force property owners to accept less or postpone sales. ‘People aren't willing to do deals right now,’ said Howard Michaels, the New York-based chairman of Carlton Advisory Services Inc., which has arranged financing for real estate purchases including the Lipstick Building in midtown Manhattan. ‘The expectation is that prices will come down.’"